Isabel Dobbel, ASG vice president for A-Status finances, at an ASG meeting last Wednesday. The group said on Sunday it will provide emergency funding to student groups whose funding was cut from schools and departments that were forced to slash their budgets this year. 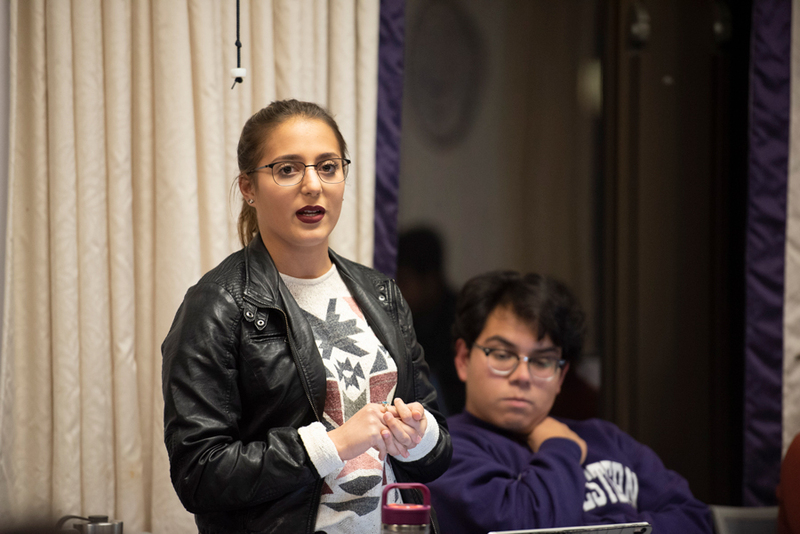 Associated Student Government will provide emergency funding to student groups whose funding was cut from schools and departments that were forced to slash their budgets this year. The news comes as several student groups funded by academic departments or schools saw a decrease in their funding for this year. Provost Jonathan Holloway directed all academic units to cut 5 percent of their budget for this academic year in response to a budget deficit. Holloway told reporters last week that some student activities “would certainly be cut.” The decision to decrease funding to specific groups, however, is under the jurisdiction of the schools and academic programs, he added. The money for the emergency fund will come from a pool of money drawn from tuition fees. Decisions will be made “in line with principles established by the Emergency Funding Committee,” the release said, adding that the assistance will come from a one-time funding cycle. To receive emergency funding, groups must prove funding for an event or operation has been revoked, provide itemized budgets from the 2016-17 academic year to the present, prove the group has applied for other available institutional or external grants and be available for an interview on Saturday, Nov. 3.